Everybody loves to eat, so it makes sense that a lot of fond memories are created in the kitchen, such as baking cookies with the grandkids or whipping up a fantastic meal for that special someone. But if you find yourself worrying about your cracked countertops instead of enjoying these special moments, then it’s definitely time for a change. Castle Remodeling has been helping residents of Agoura Hills, Malibu, Woodland Hills, Oak Park, Calabasas, and Thousand Oaks transform their dreary, outdated kitchens into gorgeous works of art for over 30 years, and we are ready to make a difference in your home. We have a fantastic reputation for providing, fast, reliable, and professional kitchen remodeling services, so let us help you get rid of your ugly kitchen woes. Whether you want to install custom kitchen cabinets or replace your laminate countertops with stunning granite or quartz, the experienced team at Castle Remodeling has the knowledge and skills to make it happen. At your initial consultation, we will sit down with you to get a full understanding of your goals, timeline, and budget. We will integrate your ideas and preferences into our design process, working with you each step of the way to ensure everything is exactly to your taste. Our contractors are experienced in all kitchen renovation services, and they are committed to exceeding all of your expectations. We can also design breakfast bars, islands, and more! If you are bored with out-of-the-box cabinets, then Castle Remodeling has the perfect solution! Our professional carpenters specialize in creating beautiful custom cabinets as well as semi-custom cabinets that will make your kitchen the talk of the town. We have a wide variety of materials and sizes to choose from, as well as various designs and colors to fit your preferred style. We are proud to offer custom and semi custom cabinets. Other services we offer include semi-custom cabinetry for quicker installations and kitchen refacing. Do you dream of having a stunning kitchen that features brand new appliances, cabinets, and more? At Castle Remodeling, we strive to make those dreams a reality! Our team has more than three decades of kitchen remodeling experience, and we are dedicated to providing you with reliable, high-quality results. Our exceptional remodeling services can transform any kitchen no matter how large or small, and we always pay special attention to your style and budget to ensure your complete satisfaction. With free estimates and competitive pricing, your dream kitchen is closer than you think! It is our goal to give you the kitchen you have always wanted in a timely, professional, and affordable manner. Once we begin a kitchen remodel, it is often completed within two to three weeks. Our company is currently offering 20% off complete kitchen remodels, so call us today at (818)-991-0361 to schedule a free estimate! 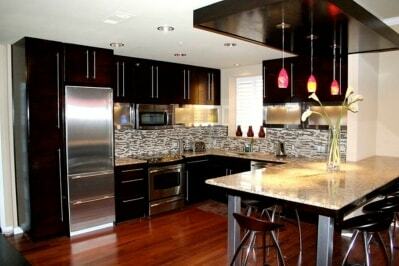 Start designing the kitchen of your dreams by calling (818)-991-0361!